The toys in this section are for your smaller birds. Many toys are interchangeable between sizes so please read the descriptions carefully as the images are for representation only. Afternoon fun for your little guys. Pauley rope, assorted beads, plastic pacifiers, vegetable tanned leather, preening balls, plastic golf balls, plastic sticks, assorted wood blocks. I think we've got a hit assortment of things to do here!! 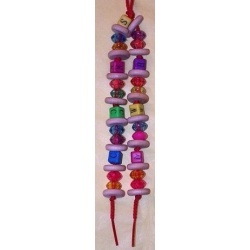 Loads of plastic alpha blocks, plastic beads and hardwood shapes on a colorful shoelace. Lots of chewing fun for the little guys. Stainless steel pear link included. There is quite the assortment of things on this toy. The base is a bagel bite with four legs of fun!!! 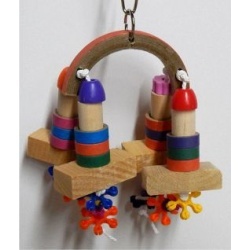 You have plastic snowflakes and baubles, plenty of heart and star beads, mini bagel bites, soft wood blocks and a hard wood tube!! Loads of fun!!! The baby possession was developed specially for small birds who love a toy that rattles and shakes. Along with loads of sound, the toy is jam-packed with action created by intriguingly textured plastic rings that slide along stainless steel chains. 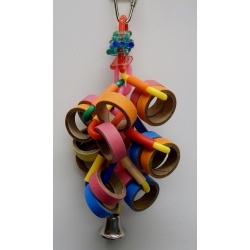 Stainless steel washers suspended from the chains add a captivating jingle and the accent of vividly colored pacifiers make this toy very visually attractive to the avian eye. Plastic fun wheels dangle temptingly from the stainless steel chains, accompanied by brilliant plastic rings that slide up and down. Pacifiers, sized exactly right for small bird tongues, filling every hold, making this toy an unending source of beaking delight. Shake it, beak it or chew it--loads of fun! 8.25 in. L X 3 in. A birdie bagel chewing toy. Tons of birdie bites, links, plastic tubes and a ringing bell on plastic chain. Hours of chewing fun. This is a very cool toy! Show your bird you love them with the hearts of the balsa stack. 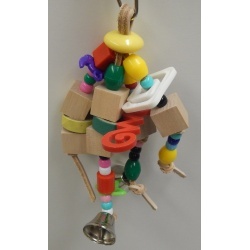 This toy has soft wood squares to chew with plenty of bright heart beads to play with and a stainless steel bell at the bottom. Vegetable tanned leather strips with hardwood barrel, plastic colorful chains, balsa wood slices, natural wood blocks, beads and baubles. 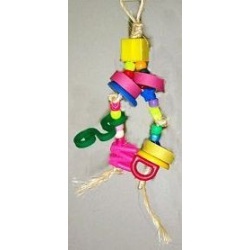 A two inch birdie bite with bell and plastic key topper, cotton supreme preening strings and links loaded with beads and pacifiers for moving fun, hanging from a stainless steel pear link. Wooden beads and a wooden wheel as the base held together by chain with 4 cow bells to keep ringing! Loads of links, pacifiers, plastic rings and barrel beads to clank and move. This is a very cool toy! The binky mobile is not a toy to put your bird to sleep. They will love chewing on the small bright wood, spinning around the bagel bites, playing with the plastic pacifiers, transparent beads and spinning wheels, ringing the stainless steel bell. This is one bright looking toy. 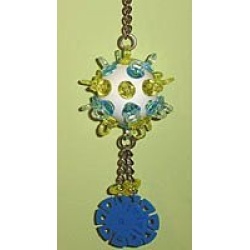 Center core of reusable chain loaded with vegetable tanned leather strips that are filled with plastic golf balls, soft wood chewing pieces and lots of donut bead and baubles for moving up and down. Topped off with a stainless steel bell and hanging from a stainless steel pear link. Sisal string, 1" bites, pony beads and plastic baubles. Fun for any of our smaller fids. Your feathered friend can count on fun with Birdy Bella! 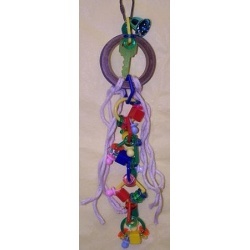 Not one but FOUR strands of hanging madness...filled with oodles of bright ringlets, pacifiers and animal shapes. Ringing entertainment is in store for your pet birdy with stainless steel liberty bells. For small birdies. Comes in various color combinations. Stainless steel parts. 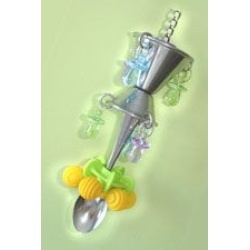 Beak-a-liscious stainless steel and plastic parts combined with a stainless steel spoon, gives the Birdy Bling a total 360 degree action motion. It will turn your cage into the most happenin' birdy party on the block. For small birdies to medium birdies. 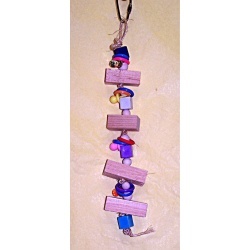 Vegetable tanned leather strips, 1" birdie bites, wood blocks, plastic shapes and beads on a pear link with two great bells!! 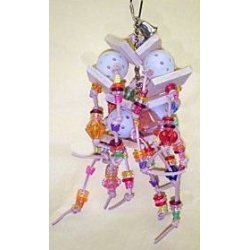 Your little one will love this toy it has 4 legs. Colorful soft plastic rings, pacifiers, wooden beads and square beads to spin. Plenty of soft wood to chew. Your bird will have a blast with this one. This toy is great for your small birds! 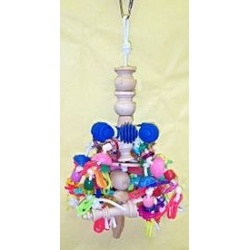 Big ole colorful plastic chewing star with center line full of many moveable wood pieces to chew with 12 strands of beads, poppers, plastic chain, animal beads all on pauley rope with a stainless pear link. So many toys to play with and keep your fid busy for hours. Various colors. A ten inch chewable plate that you attach to the side of a cage with a pear link. Put on the perch attachment that is included and hang it in your birds favorite area for playing. Perch is 6 inches long with a ½ inch diameter. Many hours of chewing and shredding entertainment on this one. Playful tubes, munch ball with shredded paper inside, bamboo chewable sunflower, a munch colored star held on with a leather strip, plastic beads and baubles and munch rounds. 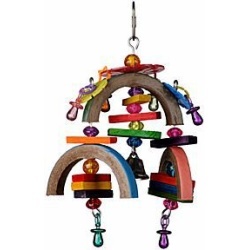 This is great toy with lots of interesting things to get and keep your birds attention! For small to medium sized birds that love shredding.